Lately I’ve gotten it into my head to try my hand at coming up with some sort of devotional practice with geomancy again, and it’s been stuck there for several days now. This post, however, is having a hard time coming out in a way I like, so it’ll be a bit more of a ramble than usual, but maybe we can end up somewhere neat that we didn’t expect. Also I’m writing it as a way to relieve a headache so I can focus on doing these 2019 New Year readings (which you should totally get one while the offer’s good, if you haven’t yet!). Recognizing the feasts of the other three archangels makes a bit of sense to me; after all, with geomancy being heavily influenced by the number four (four elements, four Mothers, four Daughters, four Nieces, four Court figures, etc. ), why not recognize the four archangels? Though we generally consider the archangel Michael to be prince of the bodiless hosts, Gabriel takes a more central importance to geomancy because he’s the one who taught the Progenitors the art. However, in my reckoning, the four Progenitors can each be associated with one of the four elements (Daniel with Fire, Enoch with Air, Hermes Trismegistus with Water, Adam with Earth), so we can also consider them each linked to one of the four archangels (Daniel with Michael, Enoch with Raphael, Hermes Trismegistus with Gabriel, Adam with Uriel). This makes a bit of mythological sense, too, considering Michael’s role in the biblical Book of Daniel and Uriel’s connection with the Garden of Eden and Adam. And, beyond that, why not recognize one’s own guardian angel as well? It’s under the tutelage, protection, and guidance of our individual guardian angels that we can all each of us learn to prosper, grow, and develop ourselves, so why not? The inclusion of All Saints’ Day and All Souls’ Day is, of course, a nod to our ancestors, both familial and spiritual, when it comes to any spiritual practice. This is definitely influenced by my other ancestor work, but why not recognize our ancestors in any practice? After all, if it weren’t for our ancestors, we literally could not live; their blood flows in our veins, their breath fills our lungs, and their bones provide the foundation for us to stand upon. That goes for our family as it does all the geomancers and occultists and other learned sages of the past, for such esteemed names like Christopher Cattan, Robert Fludd, Hugh of Santalla, Abu ‘Abd Allah Muhammad ibn ‘Uthman al-Zanati, and so forth; it’s because of them, their teachings, and their writings that we have geomancy passed down unto us today. The other feast days I listed also make a bit of sense, or at least enough to not be inappropriate. Saint Agabus is an obscure one, admittedly, but he’s given the patronage over prophets and, by extension, diviners and seers and fortune-tellers in general. St. Francis of Assisi (yes, THAT St. Francis!) is one of the holiest and most devout exemplars of true faith in God that Christianity has probably ever produced, and his connections with the environment and stewardship of the world as a whole should be inspiration for us all. Plus, there’s an ATR connection there, too; St. Francis of Assisi is the usual syncretization with the Yoruba diviner-god Orunmilá, the orisha of wisdom and knowledge and divination, and the central deity in the Ifá cult, and Ifá is distantly related to geomancy (though I neither like nor want to conflate the two). I also threw in the feast of the Prophet Samuel into the list because he was the last of the biblical Judges and the one who anointed Saul the first King of Israel and Judah, not least because he’s my own namesake but because of his role in establishing the virtues of wisdom, priesthood, prophethood, and rulership—and gives an illustrative example to the moral and just uses of divination by means of the episode involving the Witch of Endor. You’ll note that I’m basically using the Roman Catholic liturgical calendar of saints for all these feasts. I mean, that’s fair; it’s a straightforward system that’s been established for hundreds of years, the saints are almost universally known in Western culture and religion, and the use of the usual Gregorian calendar is easy. I fully recognize that not all geomancers are Christian (I mean, I’m not), but you can’t really ignore the importance Christianity (or Islam) in Western occulture generally, nor geomancy specifically. The current of faith, devotion, and power with the saints, and the mythological backing they provide to divination, is already there; why not tap into it, especially when it’s so easy to do so? Well, let’s back up. Let’s say we don’t necessarily want to adopt a Catholic approach that uses the feast days as they are. What could we do instead? In the post about those geomantic holy days, I mentioned the possibility of coming up with a geomantic Wheel of the Year that’s based on the Sun’s ingresses and midpoints in the signs of the Zodiac at the usual places, namely the solstices and equinoxes. Why not go to something like that? Sure, except how do you map the Progenitors to those days? Although the modern Catholic practice is to celebrate all the angels and archangels on the same day—Michaelmas, the Feast of St. Michael the Archangel and All Angels, on September 29—the four big archangels had their own feast days scattered across the year, roughly in line with the solstices and equinoxes: Gabriel’s feast day occurs roughly at the spring equinox, Uriel at the summer solstice, Michael at the autumn equinox, and Raphael at the winter solstice. (Yes, I write from a perspective in the northern hemisphere, but hear me out.) This arrangement makes sense at first blush, but that’s an odd order, indeed, isn’t it? The spring equinox is when the Sun enters Aries, a Fire sign, so the normal occultist would expect Michael to be honored then instead of Gabriel; likewise, for summer, it’d be Cancer and Water, so Gabriel instead of Uriel; for autumn, Libra and Air, so Raphael instead of Michael; and for winter, Capricorn and Earth, so Uriel instead of Raphael. A bit of a conflict, no? As noted above, just as there are four archangels, there are four Progenitors in this system I’m coming up with, and each of those Progenitors corresponds to one of the four elements, just as the four archangels do. While we could double up the feast days and celebrate the feasts of the Progenitors along with their corresponding archangels, I don’t like that method; for one, I try to avoid multiple simultaneous celebrations on the same day, and because Gabriel would need to be honored alongside each and every Progenitor (as he was the one who taught geomancy to them all), that means we’d really be celebrating Gabriel on each of the solstices and equinoxes, either alone (spring equinox) or along with another archangel (solstices and autumn equinox). So that’s a really messy and convoluted system. Angel-based: give the cross-quarter day to the Progenitor that matches the element of the angel that immediately precedes it. Thus, if the spring equinox is given to Gabriel (Water), then the cross-quarter day that follows it (Beltane) should be given to the Progenitor of Water, Hermes Trismegistus. Season-middle: give the cross-quarter day to the Progenitor that matches the element of the season it falls in, reckoning seasons to start at the solstices and equinoxes. Thus, if spring is reckoned to start at the spring equinox and we use Agrippa’s association of Spring with Air, then the season cross-quarter day (Beltane) should be given to the Progenitor of Air, Enoch. Season-start: give the cross-quarter day to the Progenitor that matches the element of the season it starts, reckoning seasons to start at the cross-quarter days and not at the solstices and equinoxes (as is traditional in some parts of Europe). Thus, if summer is reckoned to start at the midpoint between the spring equinox and summer solstice, and summer is associated with Fire, then this cross-quarter day (Beltane) should be given to the Progenitor of Fire, Daniel. Zodiac-based: give the cross-quarter day to the Progenitor that matches the element of the zodiac sign it falls in. Thus, the cross-quarter day between the spring equinox and summer solstice falls in the middle of Taurus, an Earth sign, so this day should be given to the Progenitor of Earth, Adam. Chronological: give the cross-quarter day to the Progenitor in the chronological order they appear in the biblical and mythological record. Reckoning the year to start at the spring equinox, this would mean the four Progenitors would be celebrated in the order of Adam (the first man), Enoch (ancestor of Noah), Hermes Trismegistus (though not given a strong temporal presence, he’s sometimes considered a contemporary of Moses or of otherwise Egyptian time periods), and Daniel (living in the Babylonian Exile period). For the same reasons that I give the four archangels to the four quarter days in the order they’ve already got, I think the angel-based method makes the most sense. Understanding the angelic day to “come first”, just as Gabriel came first with the knowledge of geomancy to bring it to the Progenitors, the angel-based method where the Progenitors follow their corresponding elemental archangel makes the most sense to me—if we were to link the Progenitors strongly to the archangels based on elemental correspondence alone. However, because the other three angels don’t really have as much a presence in the geomantic mythos as Gabriel does, and because Gabriel is most important to them all, this connection is kinda weak. Why mark the feasts by the first sunrise after the specific solar event? Personally, I like to mark such holidays and special days by being the “first full day” with the full event, because for me in my practice, I mark days for spiritual practice starting from sunrise. So, if the Sun makes its ingress into Aries at 7pm my time, then that say still started when the Sun was still in the previous sign, so it makes more sense to me to celebrate the first full day with the Sun being in Aries on the first sunrise after that. If that solar event happened at the very moment of sunrise, all the better; it would count for my purposes. Anyhow, now we have a cycle that’s tied less to Catholicism or purely zodiacal concerns, and one that’s grounded in the mythos of geomancy while still being tied to the natural cycles of seasons. 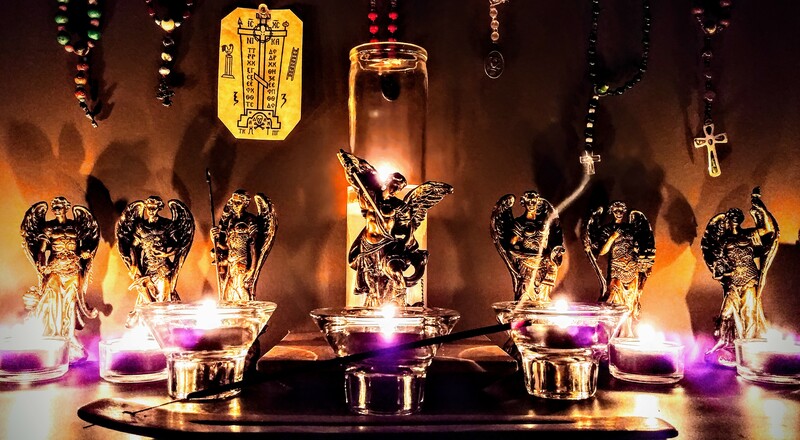 A geomantic new year is celebrated at the spring equinox, which is specifically dedicated to the archangel Gabriel, the angelic patron of geomancy and geomancers and who teaches and reveals the art to all its students. The year progresses in turn being marked by the feasts for the four Progenitors, each of whom were taught by Gabriel to pass the art of geomancy down into the world. Celebrating the new year with the spring equinox dedicated to Gabriel also has a fun coincidental Islamic connection; in some sects of Islam, this date is reckoned to be the solar calendar equivalent (Persian Nowruz, based upon the earlier and still-practiced Zoroastrian New Year festival) to when the angel Gabriel appeared to the Prophet Muḥammad ﷺ to give him the first revelation that started off the Qur’an (though that’s usually reckoned to take place during Laylat al-Qadr during Ramadan in the Islamic lunar calendar). I actually feel pretty comfortable with this novel arrangement. Though there are five main feasts that would be celebrated, which would be an odd number for geomancy, it’s really more like four feasts of the Progenitors plus a special feast that they all center around. 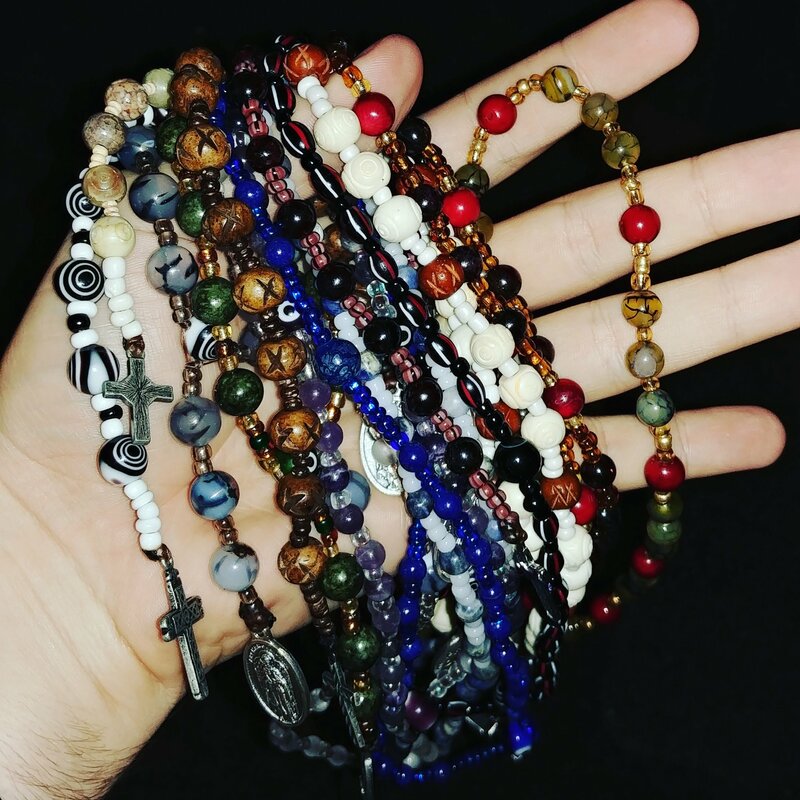 They could be balanced by adding in the other three feasts of the archangels to yield a constant and balanced eight feasts per year, sure, peppered with the other feasts throughout the year for the other saints and days taken from Catholic (or Orthodox) tradition. For me, though, it suffices to have these primary five (really, four plus one) feasts to act as holy days for a devotional geomantic practice. I can easily envision having lead-up days, such as one to four days of fasting immediately prior to the feasts of the Progenitors or four to sixteen days of fasting, studying, and praying leading up to the feast of Gabriel at the spring equinox, too, which would also work to deepen and focus devotional practices. Heck, we could give these fancy terms, too, like “Days of Cultivation” for the period leading up to the feast of Gabriel. If you’ve already attained formal contact (e.g. K&CHGA) with your guardian angel, a la Abramelin or the Headless Rite or some other practice, use the anniversary on which you established contact as your own personal Feast of the Guardian Angel. If you don’t yet have formal contact, use the day before your own birthday, being the day which you came into this world as an independent human being to celebrate your own personal Feast of the Guardian Angel. Using the day before avoids any conflicts, and allows you to honor your guardian angel as a preexisting force that gives you a foundation to live and grow. The other secondary feasts I gave up above don’t really matter as much, just being plucked from the Roman Catholic calendar for the sake of it; it wouldn’t be bad to recognize them, but it’s not needed, either. I think that with these five (or four plus one) primary feasts of Gabriel and the Progenitors, and the five (or three plus one plus one) secondary feasts of the other archangels, the guardian angel, and the blessed dead, plus at least one major period of fasting and praying, we end up with a good number of events for a devotional geomantic practice. Now to actually give it a whirl and develop devotions and practices to go along with it! After all, it is still the beginning of the year, and I do still need to make my 2019 ritual calendar. I’ll get on that soon enough…once I get some of these readings done first! It occurs to me that I talk a fair bit about geomancy, and on occasion have briefly described the factual history of the art. Geomancy, as it is understood by scholars and historians, has no pinpointed origin as yet; the best we can guess at is that the art was developed roughly around 900 CE likely in the northeast Saharan region of Africa. It was likely innovated by migrant tribes, perhaps merchants from further east or by Tuaregs or other Bedouin-esque peoples, as a form of divination that connected with simple mathematics. It got caught up in Arabic trade routes that synced up with the expansion of Islam, and spread pretty much all over from there: west to Morocco, southwest to Nigera where it became ifá, south to Madagascar where it became sikidy, and east to Palestine and Arabia where it became raml, and even further to India where it became ramalashastra. When medieval Europe began its academic discovery and recovery that we call the Renaissance, around 1100 CE, it began to import academic, spiritual, alchemical, and divinatory texts from the Arabic world from two directions: from western Morocco into Spain where this new art was called “geomancia”, and from eastern Palestine and Turkey into Greece where it was called “rabolion”. From these two fonts came a new river of geomantic knowledge that spread quickly throughout the rest of Europe within the span of a hundred years or so. From there, it quickly became one of the foremost spiritual arts of Europe and maintained its place for another six hundred years, only beginning to fade and go underground with the coming of the Enlightenment and Industrial Revolution. As older texts began to be rediscovered yet again, many parts of the Western mystery tradition became reintegrated into modern practice, geomancy with them, and here we are today. While it’s nice for an academic, it’s hollow as a spiritual story to tell. Happily, many of the older geomantic works, especially in the Arabic tradition but with no small number of European texts joining in, give us a spiritual origin story for geomancy, usually originating with Adam, Enoch, Idris, Daniel, or Hermes Trismegistus and usually from the angel Gabriel. So, on this day, the fourth day of the tenth lunar month that is the yearly Hermaia, as an offering to Hermes celebrating his joy and work in our world, I figure I’d share my retelling of the spiritual origin of geomancy. What follows isn’t exactly original, but it’s not exactly a rehash, either. Have a seat and pour yourself and Hermes a drink, dear reader, and let me tell you a tale. May the Muses smile on me and help me share this story well. As was his custom, he was sitting outside under his favorite tree during the height of the Sun’s path through the skies. Not part of the local priesthood but taught some two week’s sojourn north along the Nile, the man with the thin neck and long nose wore his usual habit of loose-fitting white robes to keep himself cool during the summer heat. His tree was on the barren outskirts of an old city, a sacred one dedicated to the Eight who made and rule the world, the scribe-god Thoth foremost among them, but although the man was well-acquainted with the local festivals and religion, he was more focused on divinity itself rather than that of any particular temple. Alas, the day when the man would see the one who calls himself Shepherd of Men would be still far off, but the man hoped every day that that day would be this one. On that day, he would begin to be called Thrice-Great by countless students. For now, he just bears the name Hermes as some foreign god does, as yet unaware of his own divine nature but more attuned to the ebb and flow of power and life in the world than most. It was under his favorite tree that the man would look at the distant roads and marketplaces, too far off to hear but kept in eyesight by the harsh light of the Sun. The tree was hardy, able to survive in rough winds as well as in parched earth, and had the benefit of offering good shade to the man especially when the Sun’s heat would be otherwise unbearable. Almost nobody came out this way to bother him, far off as the tree was without a nearby road, which gave the man good time and space to think. When he could, the man would meditate, contemplating whatever mystery snagged his intellect on any given day, but being human, he would sometimes suffer hunger or thirst or lust. Not seeing these as bad things but not wanting to indulge in them, the man would keep himself distracted by reciting prayers, analyzing interesting rocks, gazing at the stars, and conversing with the rare passer-by when one happened to wander out this way for grazing or travel to the next market. Anything he could learn, he figured, would help him eventually; even if he couldn’t yet directly know God, he could always know more about the creations and creatures around him. It was on one such day that the man was slightly more perturbed than he usually was by worldly concerns. He had family, and although he cared for them as much as a solitary philosopher could, he wasn’t always in the best contact with them. One of his sons had a propensity for spiritual development as much as he did, but his other children were better suited to buying and selling. One such son of his traveled far and wide, well out of the Black Land, and it was a rare day indeed that the man ever got word from him. Whether it was a fear of having an empty nest or having grass-is-greener syndrome from seeing a successful youth exploring the world, the man was more distracted than usual in the shade and couldn’t fully focus on his usual contemplation. Thought leaped to thought as he went from his son to his children to his own fatherhood to his own father to his own home. It didn’t help that he felt like he should only be a part of this world without being of the world, but his worries kept overriding that spiritual calling. Resorting to habit, the man looked around him and noticed the wind calmer than it should be for this time of year, the land quieter than it had been this week, the Sun brighter than he thought it could ever be. Nothing around him to take his mind off his son, the man resorted to the earth underneath him and grasped a handful of the loose, sandy dirt under his knees and held it. He felt the grit, the dryness, the coolness, the crumbliness of the dirt, feeling this handful of soil as if his palm was all he had of sense. Curious, he tossed it away from him into the air, noting how the particles of dirt traveled through the air in near-perfect arcs, the gleam and glimmer of pulverized crystal and silica shining bright once it crossed the threshold of shade into the realm of light, the smell of dry barely-fertile dirt filling the air. He began to cough and his eyes began to water as some of the dirt suddenly flew back into his face from a strong wind that came out of nowhere. That wind caught him off-guard, and the pain in his dusty lungs snapped him back to the present and the place where he sat. Once he could see clearly again, he wiped off the cough-spittle from his mouth and looked around him. The dirt he threw covered the ground, smoothed out by the wind, leaving him with a blank space before him that nearly begged to have something, anything, upon it. Feeling somewhat out of himself from the cough, like he had just awoken from a nap, he leaned forward and dipped his fingers into the flat earth before him. A dot here, a mark there, a trailing line from letting his arm rest before pulling it back. He recalled some of his education as a child in being taught simple numbers and parts of numbers, and from that memory, treated some of the marks he made as mathematical forms. He heard that, once, some teacher visiting from the far north across the Sea, the only non-Egyptian who had ever been taught by the priesthood of home, was saying something like numbers were life and all was number, but this man never really understood that kind of thing. Numbers were numbers and couldn’t eat or fight or mate, just like the lines and marks he was making before him on the dirt. Another wind came up, this time from the opposite direction. Again surprised, the man looked around himself; the sky was unchanged, the Sun barely moved, no storms on the horizon. There should’ve been no cause for this wind, considering the time of year; this meteorological puzzle would have eaten at his mind more, but he glanced down and saw that the land before him was smoothed out by the wind again, as if the marks he had made were never made at all. Frowning, he began to consider the benefit of just going home and returning to housekeeping if going outside was going to be so uncooperative. Another spasm shot through his lungs from the dust he inhaled, making him cough again. The man jumped. Opening his eyes, wiping tears from his face with a dusty hand, he looked around and saw someone standing a few yards off from him under the light of the Sun. The man saw a placid face atop loose robes of white and blue, nearly blending into the sky and sand behind him. Unsure if it was a trick of the tears in his eyes and the light of the Sun, Hermes blinked several times before letting his eyes fix on the stranger. No sound of approach, no previous call to him, unusually-colored clothes, coming from the direct direction as the noontime Sun? This was something stranger than Hermes was used to for an average day under his tree. “Of course, of course! I don’t deny anyone the pleasure of shade here. Come, have a seat.” Hermes waved the stranger over, emitting one last, small cough before the stranger could begin another conversation. “Thank you.” The stranger entered the shade and sat down gracefully a few paces from Hermes. Hermes didn’t notice that the stranger’s footsteps weren’t marking the ground, but was still looking around, still half-wondering where that last wind came from. As the stranger sat down, Hermes opened his mouth to begin his usual niceties to greet passers-by when he caught the stranger’s eyes looking directly into his own. Hermes stopped short of making any kind of utterance; the piercing quality of the stranger’s eyes seemed like pure fire, and his skin seemed to glow from something more than the Sun’s heat. Hermes snapped to his senses and shook himself out of his awestruck confusion. “Ah, er, nothing, really. Not letters, more like numbers. I was clearing my mind and letting my hands do their own thing.” Hermes grinned with some embarrassment, wiggling his fingers as if to show they thought on their own. The stranger let out a casual scoff. “Come now. Surely one studied such as yourself should know that all forms are valuable. After all, sometimes the most true meaning can come from pure accident.” Hermes nodded with a shrug, not sure what the stranger was getting at but feeling something nagging at his mind in that general, vague sentiment. “If it’s not too presumptuous of me, I noticed an interesting thing from afar. Would you show me some of the marks you made?” The stranger tilted his head coyly, but Hermes didn’t catch what the stranger was getting at. Gabriel shrugged and looked down evasively. “It’s not exactly my homeland, but yes, my tribe is settled there.” Gabriel looked up beyond the eaves of the tree towards the north, then back to Hermes. “But the road I walk is long, which is why this symbol you cast”—he motioned to the dots on the ground—”caught my eye. Would you want to know more of the truth of this symbol?” Always eager for more knowledge and more to contemplate, Hermes nodded and tilted his hand towards Gabriel, beckoning him to continue. And continue Gabriel did for quite some time, expounding to Hermes this symbol that Gabriel called the Road, and how to find this symbol as a result of multiple marks being made and crossed off two by two. Hermes began to climb to his feet to see Gabriel off, but Gabriel dismissively waved Hermes back down. “Don’t bother, don’t bother. If you like, I can visit again tomorrow and tell you more. There were other symbols I saw you drawing; those have meaning, too, much like the Road does. Would it bother you too much to visit you again?” Hermes, sensing an unusual opportunity that seemed unusual on an already unusual day, felt that this was one to seize. “Of course! You know where to find me, my friend. I’ll see you again.” Gabriel nodded and gave a slight bow, then walked off into the desert away from the Sun. The man looked towards Gabriel as he left, glancing at the symbol for the Road before glancing back up. Hermes let out a yelp; Gabriel was nowhere to be found, despite the land around being fairly clear and there being no footprints to mark Gabriel’s coming or going. Now he was certain; this stranger named Gabriel was no ordinary man, just as this day was no ordinary day, and this symbol was no ordinary symbol. Hermes leaned back on the tree, running his dusty fingers through his hair in perplexion, spending several hours more in quiet contemplation of this figure, turning over Gabriel’s lesson over and over again in his head, digesting all that the stranger had taught him. As the Sun lowered to the western lands, Hermes left his mental exploration and decided to call it a day, feeling renewed and grown in this new knowledge. Hermes got up and headed to his home in the city, leaving his marks in the dirt. The Sun set, the stars rose, the stars set, and the Sun rose once more. After the Sun began its ascent to the heavens, as was his custom, Hermes went back to his tree, seeing his marks on the ground from the day before the same as he left it. He sat back down as he normally would, and let his mind wander before settling on higher thoughts. As the morning slowly turned to afternoon, Hermes, his eyes closed in meditation, began to drift into a light sleep, when a breezy rustling through the leaves above him roused him from his nap. He looked around and found, yet again, the ground before him blank from the wind. The moment Hermes noticed his marks on the ground erased, Hermes looked up to find Gabriel approaching once more from the south. Hermes gave the strange not-quite-a-stranger a wave, and Gabriel responded in kind, raising his hand in a friendly salute as he approached the tree. “Well, you’re actually here! And if you’re here to learn, then I’m here to teach, if you’re ready for it.” “Of course, my friend,” Hermes said with a grin, waving Gabriel over, “I’d like to see what these other symbols you mentioned were.” Gabriel took his seat once more by Hermes, and repeated the same process as the day before. Again, Gabriel asked Hermes to draw a symbol, and again, Gabriel expounded the meaning of the symbol to Hermes; again, the Sun stood still in the heights of heaven, and again, Hermes became worn out from learning all that Gabriel taught; again, Gabriel offered to teach Hermes more, and again, Hermes agreed to meet with Gabriel to learn more; again, Hermes noted the unusual vanishing of Gabriel, and again, Hermes went home looking forward to the next lesson. For fourteen more days, Hermes and Gabriel continued in the same way, learning all the other figures. On the sixteenth day, Gabriel told Hermes that these were all the figures that Gabriel could teach: the Road, the People, the Union, the Prison, the Greater Fortune, the Lesser Fortune, the Dragon’s Head, the Dragon’s Tail, the Girl, the Boy, Red, White, Joy, Sorrow, Loss, Gain. Gabriel told Hermes how the first four figures could be combined from their tops and their bottoms to form the other twelve, and how each figure reflects a different story on its own. His lesson complete, Gabriel shrugged, saying that this was all that he could offer Hermes in the ways of symbols and their lore, but that this was also just the beginning of their true meaning and purpose. Hermes, entranced by these symbols and stories, asked Gabriel to return to teach the rest, and Gabriel accepted. For the next sixteen days, Gabriel taught Hermes how each figure reflects the four elements that compose all of creation as well as how they relate to the stars both wandering and fixed that determine how all things wax, wane, and transform. For another sixteen days, Gabriel taught Hermes the secrets of combining these figures two by two and transforming them by inverting and reverting and converting them into other figures, and how all these methods change and add to the meanings of individual figures. For yet another sixteen days, Gabriel taught Hermes how to use the meanings of the figures, the elemental and planetary and stellar correspondences, the combinations, and the transformations in answering all sorts of questions, imparting to Hermes the art of divination to reveal all mysteries of this world and all things upon it. Hermes nodded and smiled, wiping the patch of earth before him clean before the wind could do it for him this time. “I hope that I may, brother.” Gabriel nodded in reply and extended his hand to Hermes, which Hermes took in his own. The teacher lifted his student up and, after measuring him with his eyes, embraced Hermes in the love only brothers have. After a time, Gabriel let go of Hermes and turned away, heading for the last time towards the north with the Sun setting on his left and the Moon rising on his right. Hermes kept his eyes fixed on Gabriel’s back as he walked off, but another gust of wind blew Gabriel’s robes up like wings as it blew more dust into Hermes’ eyes; by the time Hermes could clear his eyes, there was nobody around, with neither the figures of geomancy nor the footsteps of angels to mark what happened. Sitting back down by his tree, Hermes mulled over his time with Gabriel, all of the things he learned, and all of the things he might yet learn. A quiet breeze blew, kicking up a bit of dust around Hermes but without irritating his lungs again. Staring at the ground marked with the sixteen geomantic figures, he rubbed his fingers together, noticing the fine grit of dust and sand caught between the grooves of his digits. In the last sliver of light of the Sun, Hermes got up and walked home, taking more time than he normally would to carefully settle down in all his newfound knowledge and skill. Finishing his journey well after nightfall, he paused outside the threshold of his house and looked around, seeing an empty patch of fallow ground to the side of his house. In the light of the Moon, now high in the sky, Hermes cast his first chart to see how his traveling merchant son was doing. Hermes smiled; he would never again be worried by being out of touch. Days, weeks, months, years passed. Hermes practiced his art of geomancy, but went back to his tree every day and, once his mind calmed down from the mania of having a new method of understanding the world, went back to his habit of meditating and contemplating divine mysteries. However, the man no longer doodled mindlessly in the sand, but used geomancy to explore that which he had trouble understanding. One day, he finally became great, greater, greatest among men, beholding the Shepherd of Men and understanding the source and purpose of all things. Finally, he began to teach; he no longer worried for his children, leaving them to their own devices, except for his son Tat whom he taught as a successor to his wisdom. As Hermes Trismegistus traveled, he taught arts and skills of all kinds, reserving some for particular students and others for other students, but he kept geomancy a secret, not finding one apt enough in his travels yet to learn it from him. Inspired by whispers of white and blue in his heart to teach geomancy to one who would do both him and his art well, Hermes Trismegistus traveled to the east, and gave the entirety of the art of geomancy to the one named Tumtum. Tumtum learned it and traveled west, giving it to the one named az-Zanati. Az-Zanati learned it and gave it to the Arabs. The Arabs learned it and gave it to the Europeans. The ancients learned it and gave it to us. And now I, having learned it, give it to you. So, after the hurly-burly of the past few weeks, I’ve decided to take it a little easier on myself than I have been for a bit, at least until my birthday weekend in early October. Once that’s passed, I’m going to adopt a regular five-week cycle of conjurations, going through each of the planetary angels, each of the elemental kings, and my natal genius every so often. It’ll keep me in shape and good practice, to be sure, though I’ll be needing quite a bit more incense. Good thing that frankincense is a good all-purpose offering. Ever since I called up Gabriel, archangel of the Moon, two weeks ago, my dream recall has shot up. I’ve never been much for dream recall, interpretation, or lucidity, to my occasional lament. I’ve done better with getting hints through more direct means, though it’s not for lack of trying that I say this. However, since meeting with Gabriel and having his influence begin to grow in my life, my suddenly and greatly improved dream recall is definitely one of the noticeable changes I’ve noticed. To be fair, my dreams are more active and hectic than my day-to-day life and not some ephemeral, Enya-like menagerie of imagery, so that’s interesting. 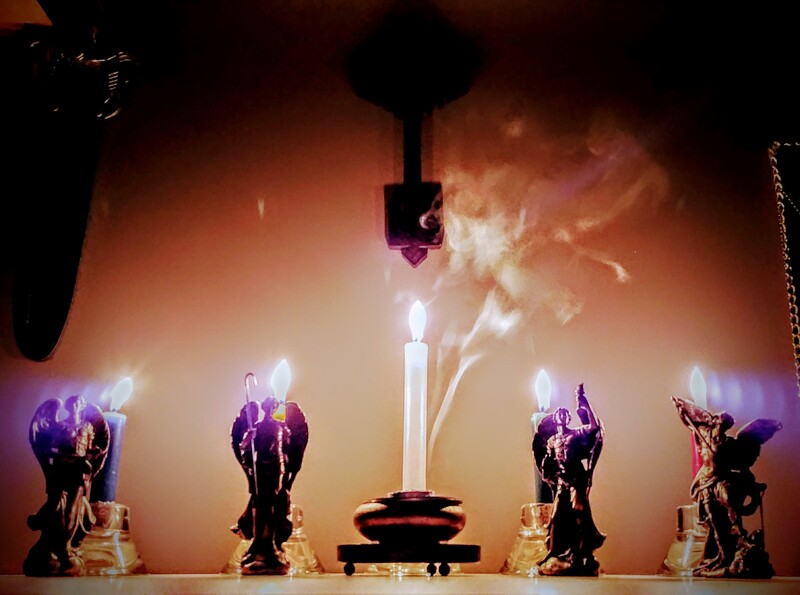 In other news, the amazing fantabulous spledid A Bad Witch is starting a series of courses at the Open Path Sanctuary blog, including an introductory course on Hermeticism which you should TOTALLY get involved with. It’s free, applicable to pretty much everyone interested in Western occultism, and yours truly is going to help out with mentoring and guiding people who need it. (Dunno why she thinks me qualified to help with mentoring, but I’ll try to help all the same.) The first course on the qualities of the elements and how they reflect in ourselves is online at this link.